The online voice of the service-learning community. October 6, 2008, Challenge Newsline #1 - Members of the U.S. House of Representatives stepped forward to honor and celebrate the ways youth are taking what they learn in the classroom and putting it into action to improve their own lives and communities. These policymakers are joined by more than 87,000 young people, educators, business leaders, and community partners from 41 states, Puerto Rico, and Bangladesh participating in the 2008 National Learn and Serve Challenge. 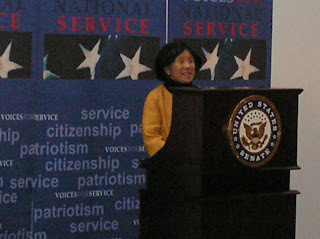 House Resolution 1463 was introduced by Rep. Todd Platts (R-PA, 19th District) with bipartisan co-sponsorship and support, including Rep. Doris Matsui (D-CA, 5th District) (pictured above). The resolution recognizes the benefits of service-learning in enriching and enhancing academic outcomes for youth, engaging youth in positive experiences in the community, and making more constructive choices regarding their lives. The resolution also encourages schools, school districts, college campuses, community-based organizations, non-profits, and faith-based organizations to work towards providing youth with more service-learning opportunities. Watch comments made on the floor of the U.S. House of Representatives in support of service-learning and the National Learn & Serve Challenge by Rep. Susan Davis (D-CA, 53rd District) and Rep. Charles Boustany (R-LA, 7th District) from C-SPAN Video Library. For viewing, disable your pop-up blocker and select "Watch Flash Video" if it does not immediately appear on your screen. Join the National Service-Learning Partnership. Membership is free.